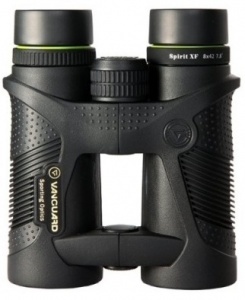 The Vanguard Spirit XF 8x42 binoculars outshine other optics in its price class. Vanguard Spirit XF binoculars offer outstanding image quality, weather resistance and user-friendly features. Expect edge-to-edge clarity, high-contrast images and brilliant colour reproduction thanks to its BaK4 roof prisms and lens coatings. 100% waterproof and fogproof, Spirit XF is made to take on the outdoors and challenging weather with textured rubber armour for a secure grip and shock resistance. Spirit XF has a unique open bridge body design so it’s lightweight, compact and comfortable to use all day without tire. The Vanguard Spirit XF 8x42 binoculars are supplied with carrying case, rainguard, tethered objective lens caps and strap and feature a limited lifetime manufacturers warranty.